The Ramage, a wooden hand press with iron platen, was built in 1820 by Scottish-born Adam Ramage (1772-1850), who sought, in his own words, “to render the hand press efficient, simple in construction, and moderate in price.” He succeeded; S.O. 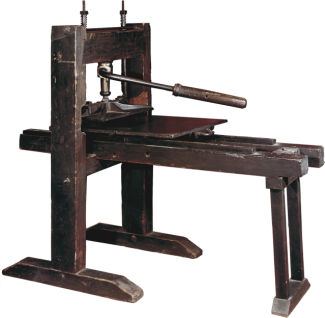 Saxe writes that Ramage “became widely known as the maker of inexpensive, durable, well-made wooden presses that were ideally suited for smaller country newspaper offices.” Ramage immigrated in 1795 to Philadelphia, a center of printing and publishing at the time. He advertised himself as a printers’ joiner, a builder and repairer of wooden presses, and in five years was manufacturing his own common presses. His improvements on the wooden press eventually made it the most popular press in the early years of the 19th century. He built presses in 3 sizes, a full size common press, a mid-sized “screw press” (shown), and a table-top foolscap press (see the Ramage Foolscap on view in the Museum). With the emergence of the iron hand presses in the 1820s, Ramage began to incorporate iron into his designs, later making presses completely of iron, most notably the Ruthven in 1817, the Philadelphia in 1833, and the American in 1845, which was the invention of Sheldon Graves. By 1837 Ramage was reported to have manufactured over 1250 presses of all kinds. These presses were never able to compete with the emerging Stanhope and Columbian presses, but Ramage continued manufacturing them until his death at the age of 78. Some information courtesy On Adam Ramage, an online history of the Ramage, by Adam Sol.